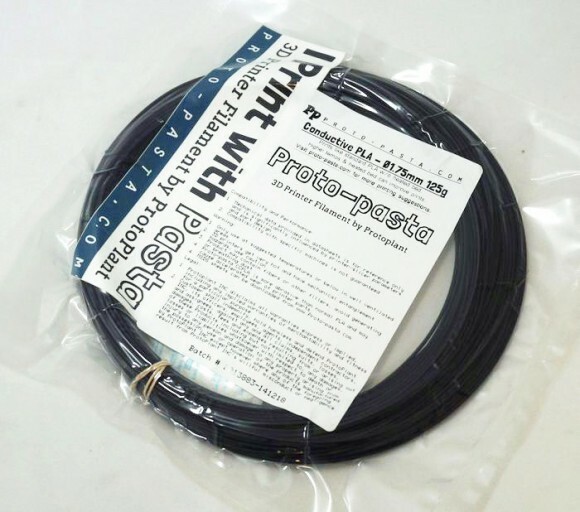 It seems that Proto-pasta is launching another interesting experimental filament – an electrically conductive PLA 3D printer filament. The project was made available on Kickstarter with a goal of just $2500 USD that we expect will soon be reached with the filament expected to be available in March this year. The Proto-pasta Conductive PLA filament should be similar in properties to normal PLA filament, though it is supposed to offer high electrical conductivity – better than other alternative conductive filaments according to the makers of the filament. The conductive 3D printer filament is ideally suited for DIY projects, however the problem with conductive filament that remains is that you are not able to solder components and cables to it – so not way to 3D print a PCB using it. The use of a good and highly conductive (15 ohm-cm) 3D printer filament that is PLA-based like the one coming form Proto-pasta will open the doors for some really creative projects that need electrical conductivity.